Century 21 Real Estate LLC, continuing its sports-focused “Smarter. Bolder. Faster.” marketing campaign, is now a sponsor of the U.S. Bobsled and Skeleton Federation (USBSF). A Century 21-branded bobsled, along with branding on all of the team’s sleds, team jackets and speed suits, will accompany the U.S. bobsled and skeleton teams during their participation in the Winter Olympics in Sochi, Russia from February 7 – 23. In addition, Century 21 will be recognized as an “Official Sponsor” on USBSF’s website and all of the federation’s press releases and newsletters during the course of the 2013-2014 sponsorship. 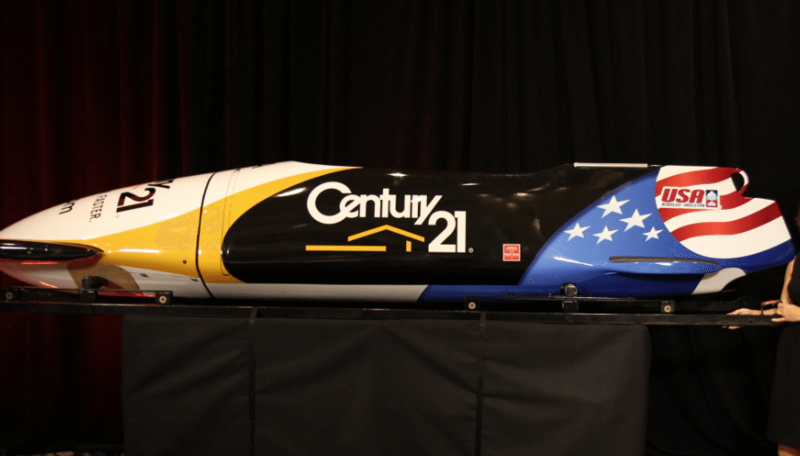 The black-and-gold-wrapped bobsled emblazoned with Century 21’s logo will also appear at all of the bobsled team’s World Cup events during the 2013-14 season stops in Calgary, Canada; Park City, Utah; Lake Placid, N.Y.; Winterberg, Germany; St. Moritz, Switzerland; Igls, Austria; and Koenigssee, Germany. “Whether it’s the Super Bowl, the bobsled team, U.S. Soccer, or the Indy 500, we are committed to showcasing the capabilities of our sales professionals in front of the largest audiences on a global scale, and in association with world-class events,” said Bev Thorne, chief marketing officer of Century 21, in a statement. Century 21 became the first real estate firm in 21 years to advertise in the Super Bowl, the firm claimed, when it ran TV ads during the big game on Feb. 5, 2012. It returned as a TV advertiser in the Super Bowl this year. The firm also bought TV space for ads that ran on NBC during 2012’s Summer Olympics, signed a two-year sponsorship with the U.S. Soccer team that began just before the same Olympics and was the primary sponsor for IZOD IndyCar Series driver Josef Newgarden’s car in the 97th Indianapolis 500 in May. “Our brokers and agents will benefit from the visibility and credibility a campaign like this will generate from real estate consumers and fans of the Games,” said Rick Davidson, Century 21’s president and CEO, in a statement. The Realogy-owned brand has also been recognized numerous times for its Facebook-focused marketing campaign.